Urban Meyer and his staff at Ohio State want to close out their 2013 class with some top ranked talent as most schools do. 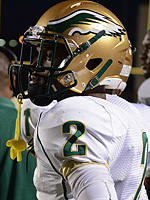 One of those players they are focused on is current Oregon commit, all-purpose running back Dontre Wilson out of DeSoto Texas. A four star recruit and the 6th best back in the country according to Rivals.com, Wilson has offers from over 20 top Division I programs and is interested in OSU. The pursuit of Wilson began with rumors of a Chip Kelley to the NFL move several months ago. Kelley is now staying with the Ducks for the next season at least but OSU’s interest in Wilson and his interest in the Buckeyes is still strong. Both Meyer and offensive coordinator Tom Herman are planning on visiting Wilson in Texas very soon to discuss him coming to Ohio State. And a visit to Columbus might be something that Wilson plans in the near future as he is considering both schools (Oregon and Ohio State) at this time.